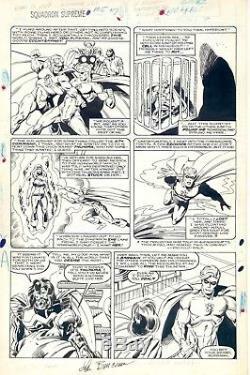 Squadron Supreme #7 page 7, pencils by John Buscema. And inks by Jackson Guice. I believe this is the only issue penciled by John. Signed by John at the bottom. Nice page from 1986 featuring Hyperion. Some whiteout used for lettering and art corrections. Low feedback or zero feedback members, please contact me first before purchasing. The item "Squadron Supreme #7 pg 7 John Buscema" is in sale since Wednesday, August 8, 2018. This item is in the category "Collectibles\Comics\Original Comic Art\Interior Pages". The seller is "ucleben" and is located in San Jose, California. This item can be shipped to United States.